Successfully Added Portable Mobile Phone Jammer （CDMA + GSM + 3G） - 30 Meter Range to your Shopping Cart. Portable Mobile Phone Jammer （CDMA + GSM + 3G） - 30 Meter Range. 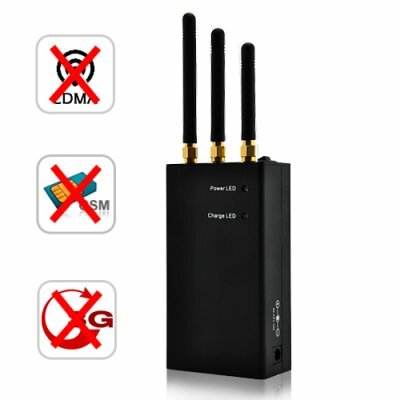 You can effectively shut down both quad band GSM and 3G cellphone signals - it even disrupts older CDMA mobile phones for silence all around, all the time! If you are sick of all those phones going off, or being tracked everywhere, this is the anti-surveillance gadget you have been looking for. This jammer system comes with a built in rechargeable Li-ion battery for hours of signal jamming, and with the included car power adapter, recharge and use this in your car as well as the office. The full spectrum cellphone jammer transmits low power radio signals to cut off communications between cell towers and any cell phones in the proximity. It does not interfere with anything other than mobile phones within a 30 meter working radius! A great anti surveillance and communication device, brought direct to you from Chinavasion at an excellent factory direct wholesale price. Available for single piece or bulk orders - get yours now! How could this jammer possibly disrupt 3G cell phone signals when the 3G frequency of 2100 MHz falls outside of The Silencer's affected frequency range of 2110-2170MHz range? Though 3G cellphones reportedly operate at 2100 MHz, the number has actually been rounded down for the sake of convenience in the same way PI does not equal exactly 3.14. In reality, 3G cellphones operate within the 2100-2170MHz range and as a result The Silencer definitely disrupts 3G mobile phone signals.